Increasingly, South Africans from all walks of life are mobilising for change. Many resort to public protest in the hope of galvanising government to improve its performance and do something about unacceptable levels of unemployment and poverty. Last year saw widespread community-level protests, along with large-scale student protests popularised by the #FeesMustFall slogan. Are South Africans reaching the end of their tether? Most protest action relates to bread-and-butter issues and inadequate government performance. For instance, half of the 2 322 incidents of protest and industrial strike action recorded between January 2013 and December 2014 by the Institute for Security Studies’ public violence monitor related to community services (25%) or labour matters (23%). A further 11% of gatherings related to protests against crime or bad policing. Mob justice or vigilantism constituted 161 incidents or 7% of public violence reported. Last month, the severity of vigilante action was illustrated by events in the town of Parys, where four farmers were charged with the murders of two suspected farm attackers. Similarly, in September last year, community members in Etwatwa killed three teenagers suspected of criminal activities. These cases demonstrate ordinary South Africans’ high levels of frustration with rising crime and what they perceive as the police’s inability to keep them safe. 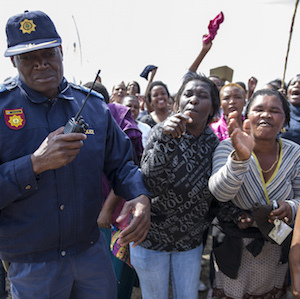 The extent of public violence is arguably also linked to broader factors, such as high levels of unemployment and inequality, the weakening rand and a protracted drought, which has brought many rural communities to their knees. Confidence in politicians – notably President Jacob Zuma, members of parliament (MPs) and local government leaders – has also been declining. The 2015 Afrobarometer survey released at the end of November on South Africans’ confidence in the president shows that two thirds of adults polled distrust President Zuma. More significantly, half of those who consider themselves African National Congress (ANC) supporters also mistrust the president. The survey found that public approval of Zuma’s performance decreased dramatically from 64% in 2011 to only 36% in 2015. The president’s shock dismissal of former finance minister Nhlanhla Nene not only spooked the markets and crippled the country’s economy, but also provoked further dissatisfaction with the president – as evidenced by the #ZumaMustFall campaign. The Afrobarometer survey also found that approval ratings of local councillors have dropped by 10% since 2011. Overall, only 39% of South Africans approve of their elected local government leaders and 42% approve of MPs. Afrobarometer’s poll on perceptions of government’s performance showed that 80% of people feel government is performing ‘fairly badly’ or ‘very badly’ in fighting government corruption, narrowing income gaps (78%), reducing crime (77%), creating jobs (77%) and keeping prices down (76%). Given the deterioration of public trust in political leaders, it is not surprising that levels of community protest and public violence have been on the rise in recent years. This year’s local government election results will reveal whether or not increasing frustration will affect voting patterns. For many, protests are a way to express dissatisfaction with their elected party without voting differently. Although the ANC achieved 62% in the 2014 national elections, this comprised only 35% of the voting-age population who cast their votes for the party, down from 58.3% in 1994. Two out of three voting-age adults either did not vote, or voted for an opposition party – while only one out of three voted for the ANC. Yet, if the 2014 national elections are anything to go by, more people may start articulating their disapproval through voting for political parties other than the dominant ANC. For many people, however, voting is not seen as an effective way to improve government service delivery, and public protest is viewed as the only way to try and affect positive changes. In their campaigns in the upcoming local government elections later this year, one should expect political parties to explain how they will create jobs, improve services and reduce crime at a local level. The Afrobarometer shows that 71% of respondents believe that unemployment is the largest challenge that government should address. A quarter of respondents believe that housing and crime (both 27%) are the most pressing issues; followed by education (22%), poverty (19%) and corruption (17%). Arguably, many local power elites are not focused on improving conditions of the communities they are supposed to serve – as shown by the state of disarray of most local government finances. Rather, some local politicians are more likely to try and distract voters from their own governance failures. One way of achieving this is by blaming marginalised groups such as foreign nationals for local problems, which may then erupt into violence, such as xenophobic attacks and vigilantism. Given that many local-level politicians see government primarily as a means of self-enrichment, rather than serving communities, it is expected then that competition will be fierce and levels of electoral violence will be higher than that experienced in the 2014 national elections. It is therefore important that political party leaders are seen to take a strong position against any forms of prejudicial or hate speech. If not, suspicion and divisions will flourish and we can expect to see further rises in violent public protests, xenophobic attacks and vigilantism.